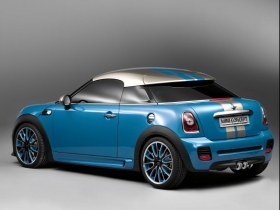 Mini plans to expand its lineup with a new roadster, shown here as a concept. FRANKFURT -- The Mini brand may develop a small car for parent BMW AG, brand boss Wolfgang Armbrecht said. Armbrecht hinted to a German newspaper that there may be some news in the coming months about a "mini" Mini that would be BMW group's smallest vehicle. ''We have always been motivated by the idea to build a small spacious car,'' he told the Financial Times Deutschland newspaper. There will be a taste of ''the next spectacular idea from the Mini brand'' at the Detroit auto show he told the newspaper in an interview published on Monday. ''Keep a close eye on the coming months,'' he added. BMW's development chief Klaus Draeger warned recently during a company event that Mini should be careful to protect its brand image and not build too many large cars. Mini is planning to launch both coupe and cabriolet versions of a new roadster in 2011in a product expansion to help reach yearly sales of 300,000 units. Through November, the brand sold 208,830 units, a 5.4 percent increase on 2009 sales. Armbrecht identified the dealer network as an important area where Mini need to develop. It is not enough for the brand to have its own dealerships, it also needs servicing and parts facilities, he told Financial Times Deutschland. Of the 1,300 global Mini dealers, only 50 percent are currently exclusive dealerships. Efforts are being made to change this to 100 percent within 10 years, he said.